I have always been an animal lover. Over the course of my childhood we had 3 cats and a dog. B never really had any pets. So, when we got ready to move in together, he wanted to get a cat. Since we both worked all day, we got two kittens, a brother and sister. We figured they would keep each other company. They came to live with us the DAY after we moved in together. We named them Maxwell and Nikita…Max and Nikki for short. About a year later, we adopted two more. They came from a feral colony that lived behind a deli in town. They were about the same age but they weren’t sisters. We named them Zoe and Kayla. While we lived in apartments, we felt that a dog wasn’t an option. Once we bought a house, we started to talk more about getting a dog since we had a nice, big, fenced in yard. That year at Thanksgiving, B’s cousin brought her new shih tzu puppy to the family gathering. We fell in love. The VERY next day, we found a breeder on the other side of CT and went to pick out a pup. We picked the last female left and named her Abby. I know, I know, we bought a dog. I can assure you, that the breeder was reputable but next time and probably from now on, we will rescue. It turned out Abby had a problem with her eye that required expensive laser surgery. In fact, B took her and returned her to the breeder. I was pregnant with L and turned into a hormonal mess so we tried to figure out how to keep her. In the end, we got Abby the surgery and the breeder paid us for about half. She has been healthy and happy ever since. Max and Nikki loved her right away but the other two never warmed up to her. A lot of people thought we were nuts for having four cats and a dog but honestly, I wouldn’t have had it any other way. I loved the fact that my kids had so many perts and the kids loved their furry friends. In December 2009, we learned Nikki had cancer. I took her to the vet for what I thought would be the draining of an abscess. Instead, I had to make the most difficult decision I had ever had to make at that point. I held my first baby girl as she went to sleep. I was heartbroken. We could tell Max missed his sister. He clung to me even more than he used to. He became my shadow, always ready to jump on my lap as soon as I sat down. I kept a close eye on him, fearful we would lose him too. He seemed perfectly healthy. Because of that, it was a shock when, just shy of a year after we lost Nikki, he had a seizure in our kitchen and passed away. I was a mess. I had lost my first 2 babies within a year of each other. Given all the other things that had happened to us over the course of the last couple of years, it was very hard to take. I thought I had a few more years with them. The cats I had as a kid had lived to 15, 17 and 18. Max and Nikki were only 10 and 11. It didn’t hep that over the years, Zoe and Kayla have reverted back to feral type behavior and have taken to hiding most of the day and hissing at anyone who comes near them. Zoe will come out and get love from me but other than that, it’s like they’re not even here. Because of how the remaining two cats behave, B kept saying we wouldn’t be getting any more cats until they were gone. And even then, he said we would only get one. As Zoe came out of her shell to me more and more, B could see that I really missed having affectionate cats. And he realized he did too. So, he started talking about getting another cat…ONE cat. When our neighbors across the street adopted a dog from a pet rescue that rents a store front in our mall, I mentioned to B that we should check it out. I thought maybe the cat could be a Christmas present for the girls. This past weekend I had to run to the Hallmark store to get the girls their Christmas ornaments, Since the Hallmark store was at the mall, we all went and we decided we would stop into the rescue while we were there. The rescue had several dogs right out front including an adorable chihuahua who only had one eye. B has always said if we got another dog he’s like a chihuahua. But we were there to look at cats so we went past the dogs to the cat area. There were several cats and kittens. They had cats of all ages from tiny kittens to cats who were a few years old. A cage with two older kittens in it caught our eye. They were a bit older, 3 months old, and they came right to the front of the cage when the girls walked over. We learned they were brothers and they were just adorable. Their names were Alexander and Troy. We looked around a bit more, and then we left. As we left the mall we talked to the girls about the possibility of getting a kitten as an early Christmas present. We told them it would likely be their one big gift (adoption isn’t cheap!) and that I would call Santa to let him know. I told B that the brothers were the ones I would want and since they shouldn’t be separated, we would have to get both. He didn’t seem real thrilled with the idea of two cats but I figured I couls work on him. We went home and put up our Christmas tree and talked about it some more. B finally agreed the 2 kittens would be a good choice so I went online and filled out the application for adoption. After we finished lunch, we decided to head back to the mall. I was afraid out 2 little kittens would be gone. I also mentioned to B that is his little chihuahua was still there after the new year we could think about adopting him too. 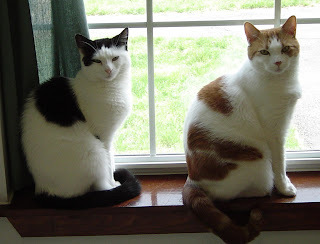 Alexander and Troy were still there and so was their foster mommy who was THRILLED that they would be adopted together. She handled all the paperwork for us and gave me the lowdown on their personalities. As I was handling that, B and the kids stayed out front where they found out the little one eyed pup had been adopted. I was thrilled for him, but I think B was a bit bummed. Once the paperwork was done, we loaded the kittens into the carrier we had brought and we went to bring them home..after a stop off for kitten food, that is. Their foster mom had said they hadn’t been around dogs recently so we knew that would be a small hurdle but we hoped that eventually they would at least tolerate the dog if not become friends with them. Xander (the shortened name suits him) and Troy have now been with us for 3 days and they are just the cutest, most loving kittens. They put up with the girls constantly loving on them. And they show plenty of love to all of us. Their relationship with the dog is still a work in progress but Xander is slowly warming up to her. I have a feeling Troy will follow along soon enough. As we come up on the sad anniversaries of losing Max and Nikki, I am glad we have 2 new babies in our home to help fill the void. They can never replace our first babies but they are helping to ease the ache a bit. We hope Max and Nikki are watching over them and us and that they know they are still very much loved and missed. But these two little loves have brought a long awaited dose of happy to our family and for that, I am thankful.